After finishing the last bite of my chocolate granola, I have to stock up. I have decided to go for a white version this time, something more colourful and lighter. Basically, it is the same as the chocolate version – check out the last post here. However, we will throw in something new. We will start the same way as last time. First, you want to boil the water and mix in the chopped chocolate and oil. Keep steering, add all spices – cinnamon, black pepper, vanilla sugar, and salt as well. Put the rest of the ingredients into another bowl and mix them together, pour over the prepared sauce. If you think the mass is too dry, try knead it with your hands. It is a weird initial feeling, I agree, but it is very effective and at last fun as well. When you finish playing with the raw granola, spread it on a baking tray and put into oven for 45min at 110-130°C. I have not mentioned it last time but I have split the mass into two halves and baked them seperately to make sure my granola will be crispy at the end. Maybe it would work even all at once, I just do not want to take any chances :-). For my surprise, the outcome was very different comparing to the last time. Going light on chocolate made the granola more crispy and definitely lighter. What is more, I have been very impressed by how big the cranberries grew in the oven. Yeah, the baking makes such a difference. The granola is much better than some dried fruits mixed into your muesli. I think, I am adicted and I am already looking forward the third version, I might go with something nutty next time! I have been in love with the chocolate muesli from Emco  for quite some time. I like muesli in general but I like it better when it has a more complex taste and mixing some dried cranberies into oatmeal just doesnt work for me. Unfortunatelly, Emco does not export to Germany, or at least I have not find their products here yet, so I had to import them on my own. You can imagine, travelling home twice a year, you have plenty other stuff you want to put into your suitcase. So after prioritising my list, I would end up with one, sometimes two 750g package(s) for several months. Nevertheless, those dark days are over now! I have recently mastered a recipe for my own homemade chocolate granola. 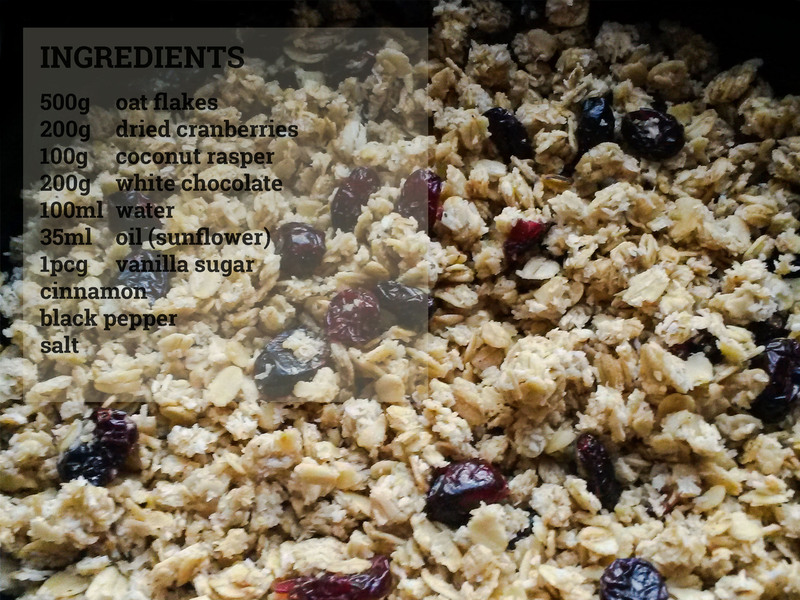 Put the rest of the ingredients – oat flakes, coconut rasper, almontds, suntana, and whatever else you like in your granola, e.g. hazelnuts or cranberies etc., pour over the finished sauce and mix it up all together. Then, scatter the mass on a baking tray lined with backing parchment or alluminium foil. Now, set the oven for 160°C and wait for ca. 45 min. Do not worry about preheating the oven in advance, at least will the the ingredients get a chance to soak in the sauce! When it is finished, just open the oven, leave the tray inside and let it cool off in that dry air. Afterwards, store your the crunchy granola in a glass to prevent the air humidity getting into it before you do. Emco Mysli na zdravi – link. The article about black pepper – link.